From the fountains of Bellagio in Las Vegas to the small relaxing fountains flowing in your garden, there are so many styles and designs to choose from. We’d like to take you on a journey through our favorite water fountain designs. Let us know what you think. In this design, similar to many other antique statuary fountains, you’ll notice extravagant attention to detail in the marble carvings and antique finish. The beauty not only lies in the aesthetics but in the story carved into the stone. 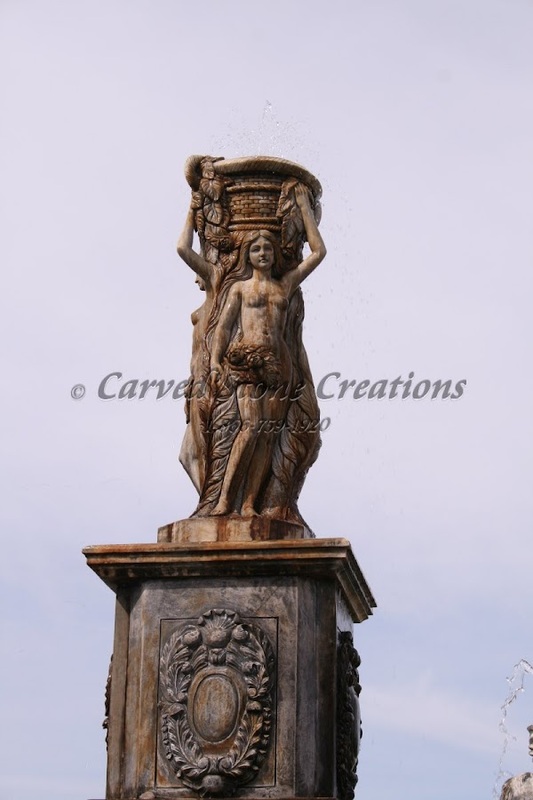 The very top of the fountain features a modified version of The Three Graces sculpture. These women are believed to be the daughters of Zeus: Euphrosyne, Aglaea, and Thalia. There are four seahorse creatures or hippocamps around the base and four Tridents riding the seahorses blowing conch shells that spray water. The bronze sculpting process allows for an incredible level of detail, as seen in this breathtaking fountain design. Bronze blends beautifully into any landscape or garden because of its earthly colors. These fountains can be made into a wide variety of animal sculptures as well which are great for spitting fountains or garden fountains. Contemporary fountains are typically more simplistic and modern like the one you see here. They have a minimalist, geometric shape that come together into an elegant masterpiece. What’s unique about these is they can accent both indoor and outdoor areas and still fit the overall elegance of your home or garden. In these fountains, the sphere at the top virtually appears to be weightless in this floating sphere fountain design. The black contrasts with the lighter stone color columns making the entire design, including the floor pattern, very pleasing to look at. Adding this fountain to an environment like a spa or hair salon adds the perfect relaxing aura to the experience one gets when getting their hair cut or nails done. The trip to the hair salon turns in to an ambient experience for these guests. Wall fountains are versatile in that they can go in so many places and add aesthetic value both inside and outside. They also don’t have to take up a lot of space and still be an eye-catching and stunning addition to your home. These range in styles and designs from contemporary to antique, with anything from lions to children, and from highly detailed to modern and simplistic. Many times, when you see a spitting a fountain, it is usually an animal like a frog or a crane shown here, or a person emptying water from what they’re carrying. This particular fountain is made from granite and is low to the ground portraying a contemporary, sleek feel. Naturally, carved stone fountains are another great option for landscaping and garden fountains to capture the beauty of the stone while enjoying the relaxing sound of the stream. In addition to the simple shapes of the rock, you might see animals carved into the stone to mimic the way animals actually sit on the rock. These are water fountain designs of natural stone. The unique natural rock fountain shown here retains the rustic appearance of natural boulders. It has been repurposed into a fountain that includes hand-carved decoration. These are bubbling basalt columns and can be bought in different heights, depending on your preference. Natural stone fountains are best for outdoor use because of their earthly tones and rugged appearance. Tiered fountains come in anywhere from one to four tiers and can be five feet high garden fountains to 12 feet high estate fountains. Water cascades from the top of these tiered fountains giving the soothing sound of running water. Tiered fountains are hand carved with ornate detail in a variety of classical water fountain designs by artisan sculptors. Cast stone fountain made from natural stone and require less maintenance. Want to see one of these beautiful fountains in your landscape? Sign up for our free Photoshop presentation.